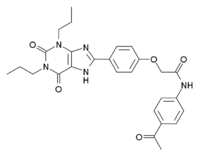 MRS-1706 is a selective inverse agonist for the adenosine A2B receptor. It inhibits release of interleukins and has an antiinflammatory effect. This page was last edited on 4 September 2017, at 06:36 (UTC).